Spray medium skillet with cooking spray; heat over medium heat. Add white portion of green onions and garlic; cook 1 minute, stirring occasionally. Add artichokes, bell peppers, olives, oregano, basil and black pepper. Cook 8 minutes, or until vegetables are crisp-tender, stirring occasionally. Remove vegetables from skillet; cover to keep warm. Pour Egg Beaters into same skillet. Cook until set in center, carefully pushing cooked Egg Beaters to center of skillet with spatula and tilting skillet as necessary to allow uncooked portion to flow underneath. 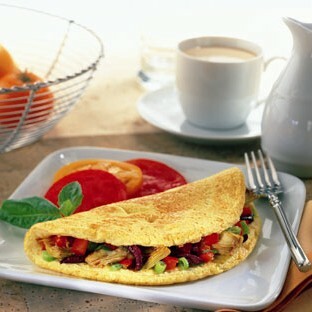 Spoon vegetable mixture over half of omelet; sprinkle with 2 tablespoons cheese. Fold omelet in half. Slide onto serving plate. Top omelet with remaining 1 tablespoon cheese and reserved green portion of green onion. Cut into 4 wedges to serve.